If you're trying to think of something special to do for your Mom, how about a Mother's Day breakfast-featuring pancakes. Now these particular pancakes aren't your typical flapjacks. These pancakes are not only ball-shaped but they also contain much more than meets the eye. This bite-size twist on breakfast is called ebelskiver which is a traditional dish in Denmark. My ebelskivers were made using a special stainless steel pancake pan which has multiple wells to hold the batter and gives the pancakes that sphere shape. The pan fits right over the stove top and can be used on a gas or electric appliance. Mix up the pancake batter and pour a tablespoon into each well. The surprise treat when it comes to ebelskivers is what you put inside them. Each one gets a yummy filling and just about any favorite flavor will do. I selected an assortment of fillings this time around including a delicious lemon curd (which has a combination sweet and tart taste), gourmet red raspberry preserves (which is one of my all time favorites) and my kids' top option-milk chocolate wafers. Drop a teaspoon of filling or a few chocolate wafers right on top of the batter you just poured. Then add another thin layer of batter over the top to cover the filling. You can't walk away from the stove during preparation, because it takes a very short amount of time for the bottom to brown and then you have to quickly flip the pancakes. Once the sides cook to a light brown, use wooden skewers or toothpicks on both sides to gently roll the pancake ball over so the other side can brown completely. When everything has browned nicely, simply dump the pan and all seven of the pancake balls will tumble out. Finish off the pancakes with a sprinkle of confectioner's sugar and your Mom's Day breakfast is almost complete. By the way, once you bite into one of these little pancake balls you may never go back to traditional pancakes again. The pancake and filling are a perfect combination and this is one breakfast where you can skip the maple syrup. To make the morning even more special, add delicious decadence to the plate with a few chocolate-dipped strawberries and a dollop of whipped cream. You may want to keep this idea in mind for future reference because you can also use the pancake pan for more than just breakfast fare. Among other things, consider using a light pastry recipe and fill the balls with chopped, cooked chicken breast and broccoli for savoryhors d'oeuvres. Just imagine the possibilities. In the meantime, Happy Mom's Day to all and Bon Appetit. The strawberry looks yummy. I dont care if I have allergy on it but if it is as mouthwatering as that, then lets forget about the allergy. I’m way late to this party but just meandered over from Margaret’s “Way to Garden” blog. Was thrilled to find this post as I scrolled down. I have my Danish grandmother’s pan, but it’s years since I’ve made these. Will have to surprise my sister, mother and brother-in-law with them soon, though it’s long past Mother’s Day. Thank you! I just came accross your blog, and I have to say, I thought I was the only person in the world to ever hear of or make and eat an ebelskiver!! Those look beautiful! oooh I bought a pan like this years ago and havent been able to use it because the recipes on the package are all in Dutch and I cant speak that language. I was hoping you had the recipe on this entry or a link to where you made them from. May I? You are definitely thorough, if a person can make Jell-O they can follow your directions. Any Group would be lucky to have you involved in their fundraising! Should have come to your house for Mother’s Day…these look great! Fun idea! Oh my, this looks SO yummy!!! Hope you had a Great Mother’s Day too!! Those pancakes would have made any mom feel like a Queen! Yum yum! Well, I was trying to talk myself out of baking today…I eat too much of it…but now, sighhhhhh…you made me do it! LOL! Those pancake balls look great. How delightfully dainty and tasty those look!!! Looks delicious and I’m intrigued by the idea of using the pan for other things besides pancakes. Yummy and so pretty looking! I’d never heard of a pan like that. Seems like this recipe would have endless creative possiblities. My friend has this pan and I always think about getting it. They look so good….we would ALL think this was yummy. I wished my mom lived near because a breakfast would be such a sweet treat. DROOLING! Wow, Lisa, those look so good. I love those pans too. Lemon curd and of course, chocolate sounds scrumptious! Those look yummy! Thanks for sharing. I ahve had them with apples, but all the other fillings sound good too! My dh loves lemon, that would make a good Father’s Day breakfast also! This looks so yummy and what a wonderful way to present the meal with the chocolate strawberry’s. I always look forward to your posting. MMMMM! Mouth watering goodness! TFS! The pancakes look absolutely delicious and would make any mom smile on Mother’s Day morning! :o) You truly do celebrate creativity in all forms! :o) I enjoy all the wonderful things you share. Thank you so much! You and your family enjoy a beautiful coming week! for different kinds of fillings. Thank you for your great blog and all the craft suggestions. Ah, yes a good old fashioned Swedish breakfast. Nothing better! And that’s our local Maury Island Farms jam I see you have too. You could have been posting this from my kitchen here in Seattle! I hope your kids are old enough to make this for you on Mother’s Day. Those pancakes look fantastic! I would love a breakfast like that on Mother’s Day. Gorgeous photos, Lisa – my mouth is watering! I’ve never heard of these – they sound absolutely delightful! So yummy sounding!! I think I’m going to have to try!! Oh these are making me hungry!! Thank you for sharing, I might just try this for my mommy! oh lisa, those look absolutely delicious. and they are easy (you know me with easy – it has to be or i won’t attempt it). i could do those. i think i saw those in a williams sonoma magazine. yummy. thanks for sharing. i am going to make those. Ooooh, thanks for the reminder Lisa — we love Aebelskiver’s in our family, but haven’t had them for our Mother’s Day brunch. 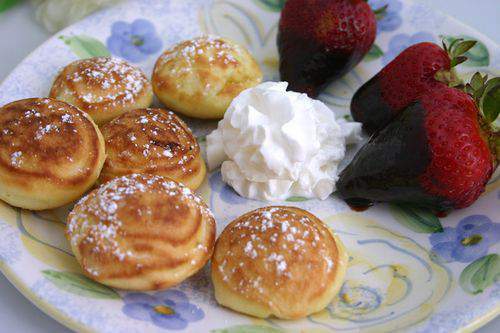 We usually do french toast, but I like Aebelskiver’s so much more — I’m thinking a substitution is in order. I turn ours with a metal knitting needle ;-). Those look soooo good! Happy Mother’s Day to you! You have a definite flair for presentation. Everything looks so yummy! You make my mouth water. Now it’s time for breakfast. I’m going to need something really good after seeing that delicious fare. My oatmeal might not do it! LOL! do you think it’d be tacky to send a link to this post to my hubby? They look delicious filled! Can’t wait to try them! I love ebelskivers…had them while visiting Solvang, CA, a dutch community. Yum. I’ve never tried them with delicious “fillings”. What a delicious Mother’s Day breakfast that would be. oh YUM!!! I look so forward to your posts! oh my goodness these look scrumptious! They look delicious, in fact good enough to eat!